As ever the Knitting and Stitching Show at Alexandra Palace, London was so inspiring. My friend Charlotte and I go every year, I think this is the 6th, with packed lunch and a plan….. This year we did things a little differently and started with the artist and student exhibitions. Some of the knitwear students work was genuinely brilliant, distinctive and really well presented; Caren Garfen had a huge exhibition space, I bought one of her ‘tea towels’ a few years back when she was at the show as a graduate exhibitor – it’s framed and hangs in the hall; my favourite piece though was by Susie Vickery see it here ‘Charles Babbage:A conversation’. 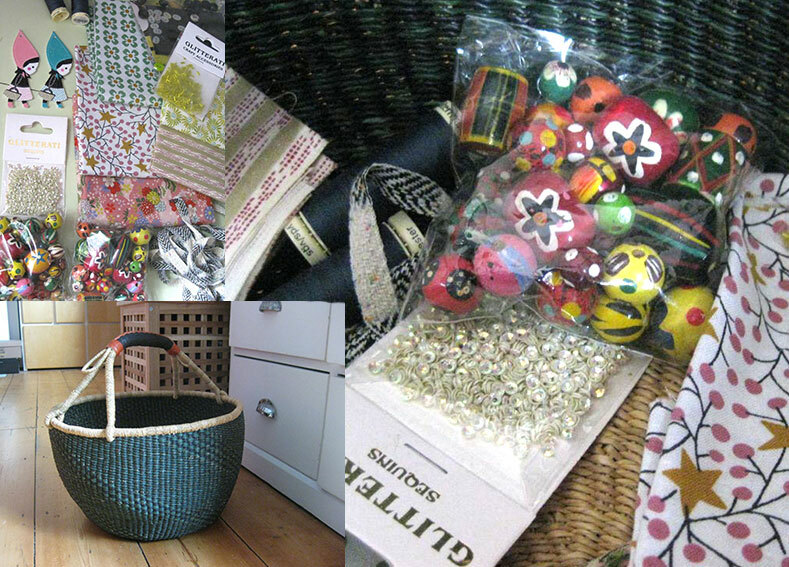 The first thing I bought was a lovely book ‘Text in Textile Art’ by Sara Impey, then some star decorations made in India from vintage saris which inspired me to buy some rather sparkly braids, ribbons, sequins with the Christmas Market in mind. The Merchant and Mills stand had lovely fabrics and there were nice made up garments of their patterns which looked much nicer than they do on the website! This was the first year we stayed right to the end… all the coffee shops were shut!!! This entry was posted in Report on October 12, 2014 by lisabenn. Yesterday Laurel and I went to the Museum of Childhood principally to see the Jacqueline Wilson Exhibition. We’ve both read her autobiography so there wasn’t much new to learn really, but the original Nick Sharratt drawings are beautiful and I was struck by how small they are. We were very taken with the Hand Me Over Hand Me Downs exhibition by artist Annabel Stockman (Laurel took lots of photos for her sketchbook). Photographs of clothing and items which came with babies adopted from China. Fabulous mixture of contemporary and traditional clothing, some of it adapted with hand sewing by the orphanage staff, and personal items like spoons or bags of Chinese soil. It was quite moving of course but also very nicely displayed and very inspiring design-wise too. This entry was posted in Report on September 1, 2014 by lisabenn. Forgot to mention before. I had a great afternoon at The ‘Making Colour’ Exhibition (National Gallery – £8) and the BP Portrait Prize Winners Exhibition (National Portrait Gallery – FREE) a week ago with my younger daughter and a friend. Very thought provoking stuff if you are at all arty; and followed with a visit to the Portrait Gallery next door had you really thinking about colour in practice especially the winner ‘Man with a Plaid Blanket’ which was like a kind of summary of the ‘Making Colour’ Exhibition. ‘Making Colour’ finishes 7th September and BP Portrait Prize Exhibition finishes 21st September. Between the 2 exhibitions we had lunch at the handily placed, enormous, Pret-a-manger next door. This entry was posted in Report on August 17, 2014 by lisabenn. Spent the afternoon at Bubble – kids trade show at The Business Design Centre in Islington; my buying consultant hat on, with Fran from Nipper Skipper http://nipperskipper.co.uk/ . We hadn’t gone with any great expectations this time, but unexpectedly found some really fantastic things which will fit neatly in the next stage of Nipper Skipper’s range development. Particularly taken with Snapper Rock (New Zealand) UV beach/swimwear; Bogs (Canada) neoprene ‘wellies’ with fab 70’s prints, very cool rubber wellies and canvas deck shoes; Sand Dollar (?) a couple of really brilliant graphic designs on uv sun protection tops. Among the fashion clothing ranges, beautiful ‘organic’ almost Autumnal colours, lots of dusty red, stripes featuring heavily and lots of octopus logos! Alongside the usual stands filled with alarmingly frilly dresses!! This entry was posted in Report on July 14, 2014 by lisabenn. I really look forward to my annual trip to The Knitting and Stitching show with my great friend Charlotte. I bought this beautiful Bolgatanga (Northern Ghana) basket from The African Fabric Shop, I’ve been eyeing them every year but this time I treated myself. We loved the painted wooden beads … definitely thinking ‘Christmas decorations’ with these. However the best thing this year was the Dorothy Caldwell exhibition – just beautiful, photographs don’t do the work justice, go and see her stuff if you get the chance! This entry was posted in Report on October 15, 2013 by lisabenn. A new show to complement the one they do at Alexandra Palace in October. I went with my great friend (and Knitting and Stitching Show companion) Charlotte. This show wasn’t as good, missing some of our favorite sellers, the exhibitions of art and student work, but it’ll probably improve in future. 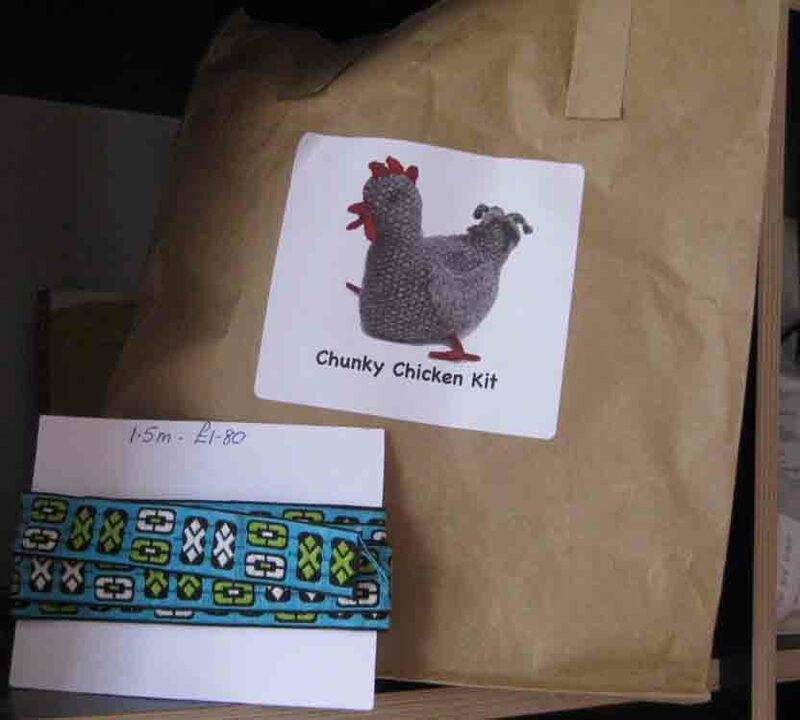 I bought a gorgeous knit-your-own chicken kit with Icelandic wool, and some braid which I’ve no idea what to do with yet but it was a bargain. Charlotte bought wool yarns and vintage (Nepalese? )indigo fabric, which she uses to display her delicate ceramic works. This entry was posted in Report on March 21, 2013 by lisabenn.